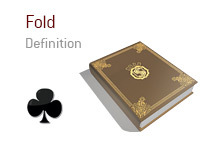 What does the term "fold" mean as it applies to the world of poker? What is the definition of the term "fold"? In poker, "folding" occurs when you give up on the hand when it is your turn to act. Folding takes place when you toss your cards into the muck and/or verbally declare that you have folded your hand. You are sitting in a 6-max cash game at a local casino. You are currently on the button. A player in early position raises, and the next player to act sticks in a re-raise. The next player folds, and you look down at 7h-3h. Given that you have a raise and re-raise in front of you, and given your extremely weak holding, you announce a fold and toss your cards into the muck. You have verbally declared your fold and are now out of the hand. Even if the flop comes 5h-6h-4h, you can not re-enter the hand as you have already folded.